Tribute in Light and clouded skies, this week in pictures. 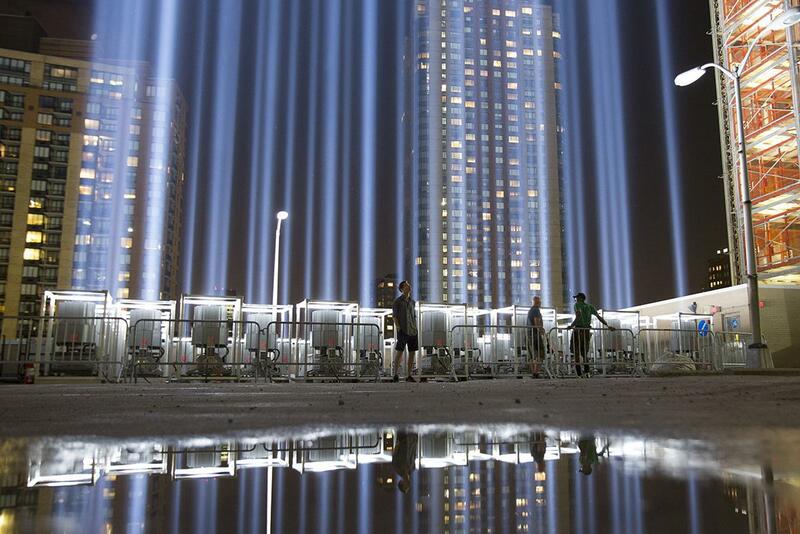 People gather at the “Tribute in Light” in Lower Manhattan, New York, on Sept. 9, 2015. The tribute was lit two days ahead of the 14th anniversary of the 9/11 terrorist attacks. 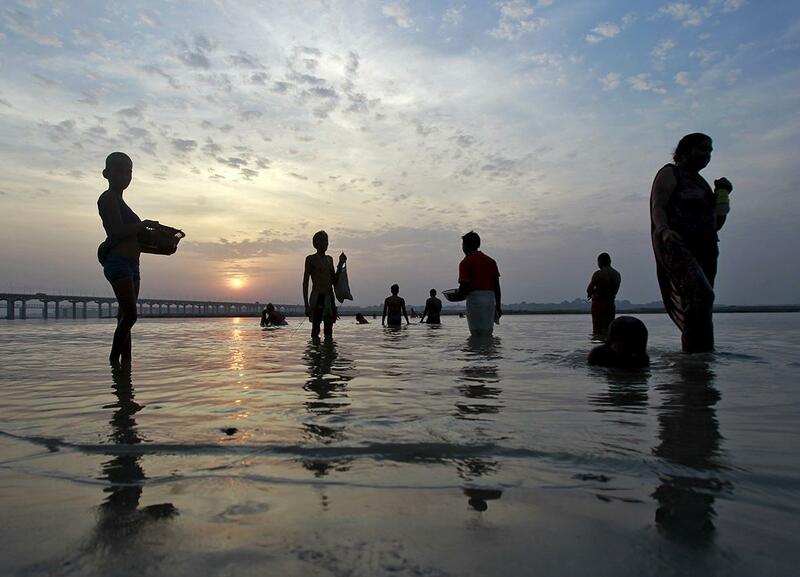 Hindu devotees stand in the waters of Sangam, the confluence of the Ganges, Yamuna, and Saraswati rivers in Allahabad, India, early on Sept. 10, 2015. 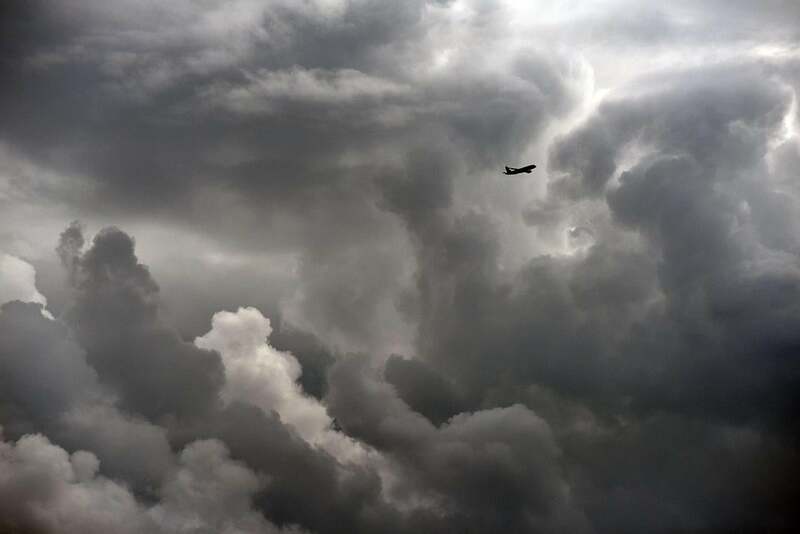 An airplane flies through a stormy sky before landing at the Toulouse-Blagnac Airport, in France, on Sept. 3, 2015. 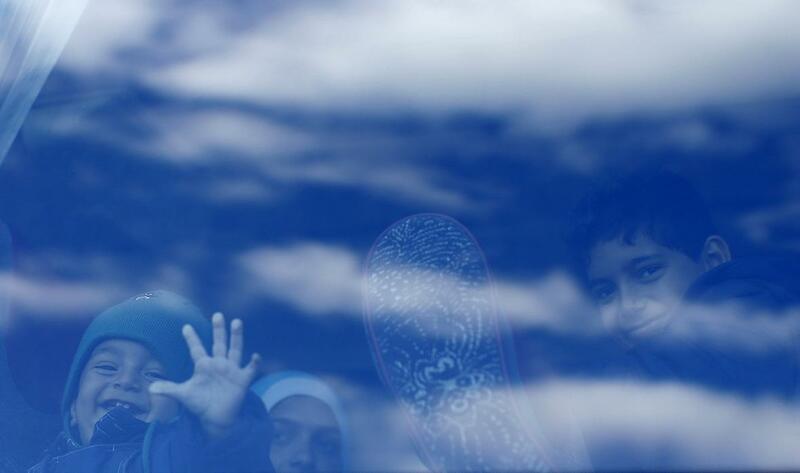 A boy waves inside a bus as migrants arrive at a refugee camp at a former police compound in Berlin on Sept. 7, 2015. Struggling to cope with a record influx of asylum seekers, Germany told its European partners on Monday they must take in more refugees too, saying the burden could not fall on just a few countries. 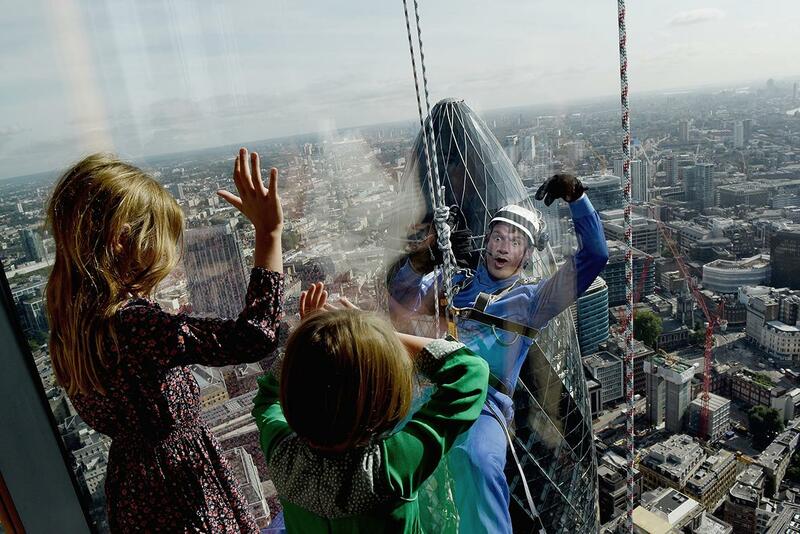 Saorsie and Aoife McAuley wave to their father Andrew McAuley, from AkzoNobel, as he abseils down the skyscraper known as the “Cheesegrater” at 122 Leadenhall St., during the City Three Peaks Challenge, a charity fundraising event, on Sept. 7, 2015, in London. Dancers perform the “Abbots Bromley Horn Dance” in the village of Admaston, Staffordshire in central England on Sept. 7, 2015. The Abbots Bromley Horn Dance, an English folk dance whose origins date back to the Middle Ages, is performed annually on Wakes Monday. 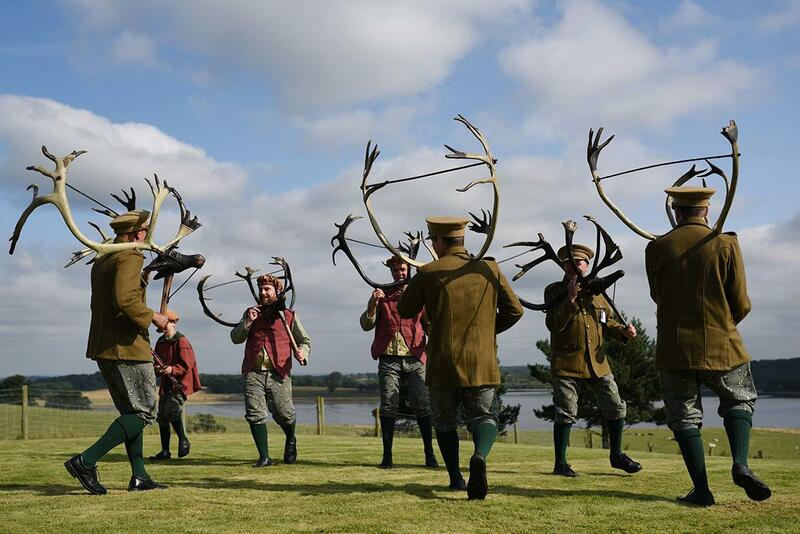 The dancers comprise six Deer-men bearing reindeer antlers, a Fool, a Hobby Horse, a Bowman, and Maid Marian. Musical accompaniment to the dance is provided by two accordion players and a boy playing a triangle. 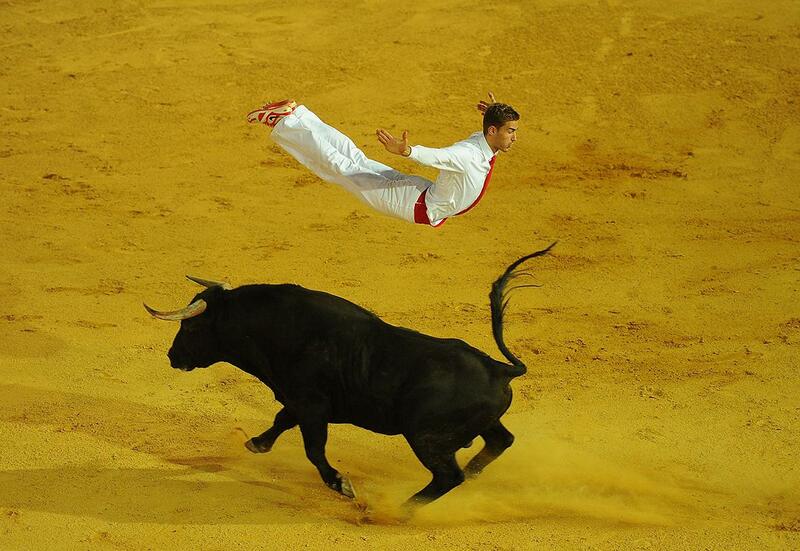 Fabien Napias of the French Recortadores company Passion Saltador leaps over a charging bull at the end of the Liga de Corte Puro finals at the Plaza de Toros on Sept. 6, 2015, in Valladolid, Spain. The art consists of leaping, diving, and somersaulting over charging bulls. 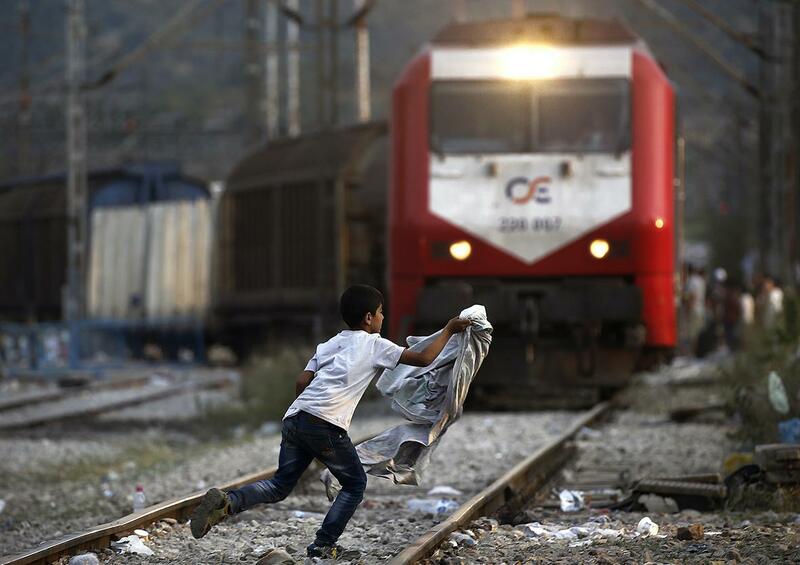 A Syrian refugee boy runs across rail tracks as a freight train approaches near Greece’s border with Macedonia, outside the Greek village of Idomeni, on Sept. 7, 2015. Thousands of migrants and refugees were crowding at Greece’s border with Macedonia on Monday morning, their entry slowly rationed by Macedonian police. Schoolchildren dressed as Hindu Lord Krishna wait to perform during celebrations on the eve of the Janmashtami festival in Chandigarh, India, on Sept. 4, 2015. 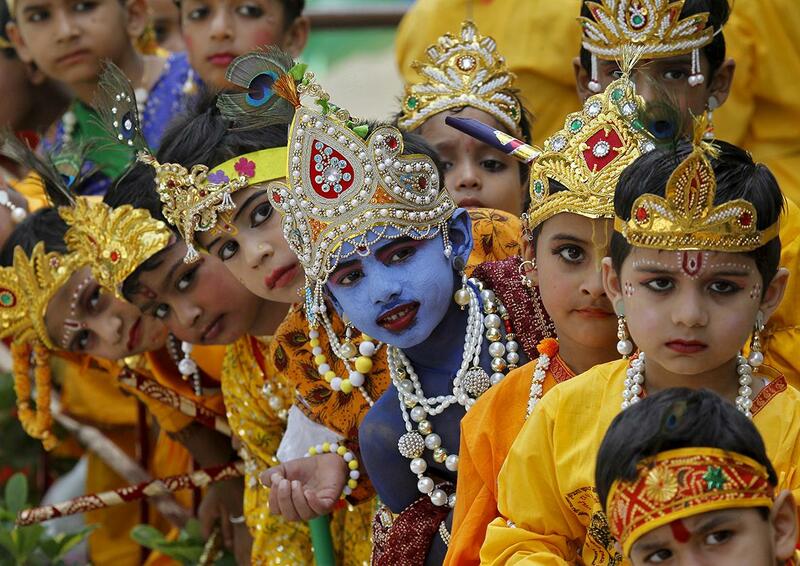 The festival, which marks the birth anniversary of Lord Krishna, was celebrated across India on Saturday. 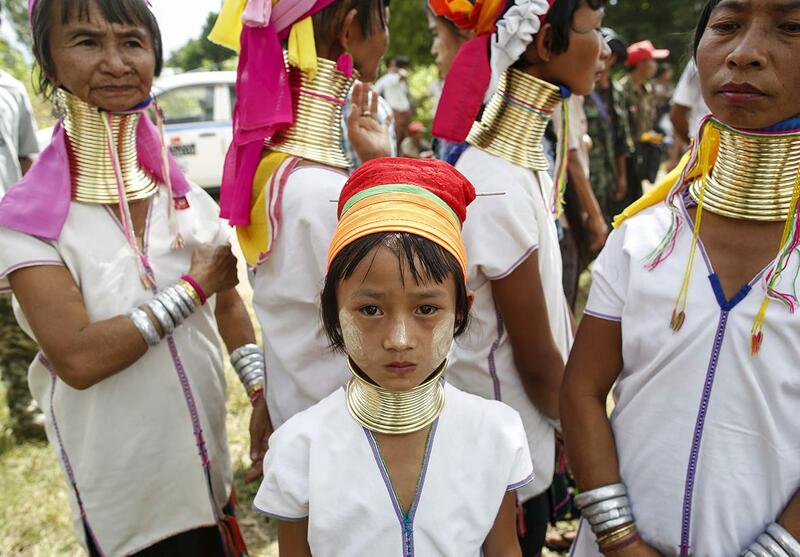 Mary, an 8-year-old ethnic Kayan girl, and her relatives stand as they wait for Myanmar pro-democracy leader Aung San Suu Kyi’s arrival during her campaign for the upcoming general election, in Demoso, in Myanmar’s Kayah State, on Sept. 10, 2015. Suu Kyi is touring the country ahead of Myanmar’s first general election since the end of military rule. 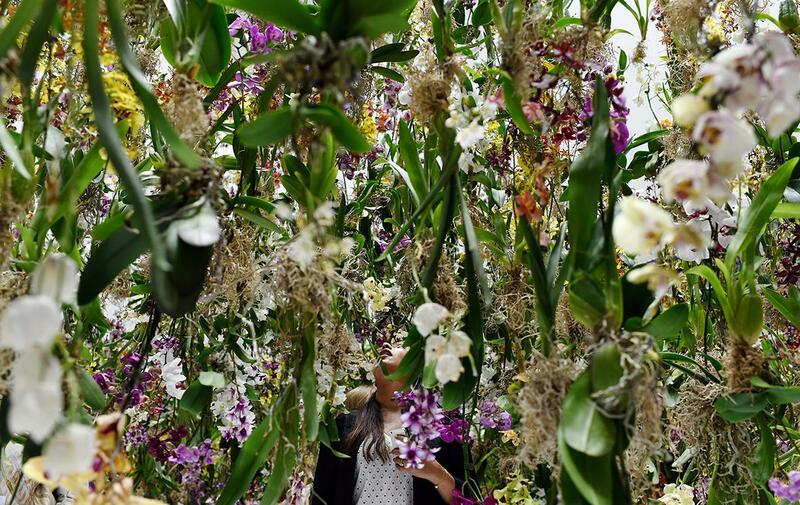 A woman walks through the Japanese TeamLab Floating Flower Garden Space as part of the “House and Object” professional trade show on Sept. 5, 2015, in Villepinte, France. 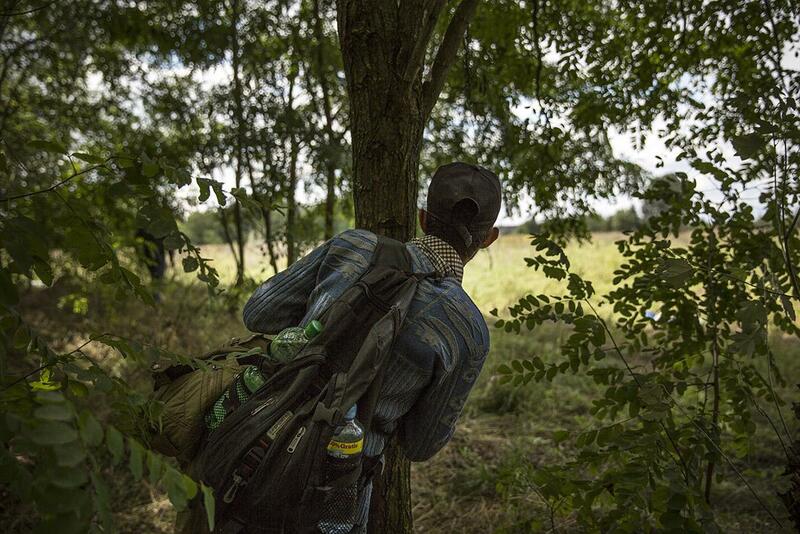 A young Syrian man from Damascus tries to evade the Hungarian police by sneaking through a forest close to the Serbian border on Sept. 8, 2015, in Morahalom, Hungary. Many migrants fear that if they are forced to officially register and have their fingerprints taken it will stop them being able to move out of the country and further into Europe. Thousands of migrants have continued to cross into Hungary from Serbia over the past few days. Since the beginning of 2015 the number of migrants using the so-called Balkans route has exploded with migrants arriving in Greece from Turkey and then traveling on through Macedonia and Serbia before entering the EU via Hungary. The number of people leaving their homes in war-torn countries such as Syria marks the largest migration of people since World War II. 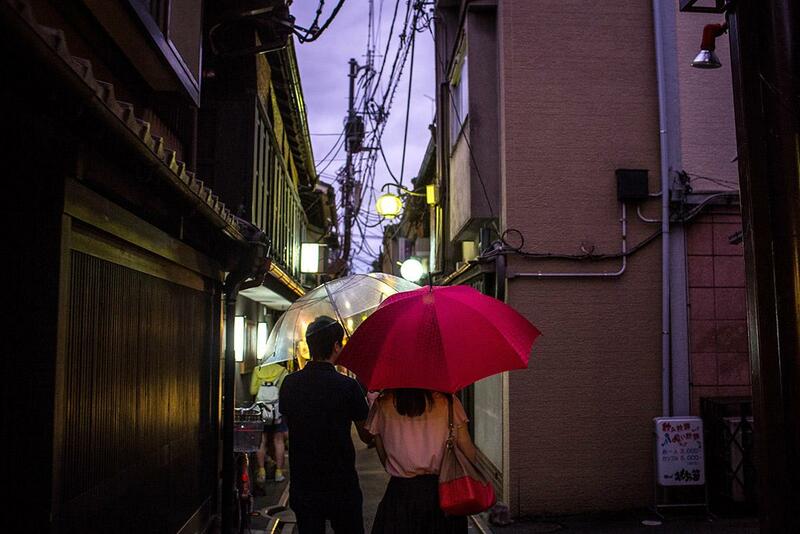 Tourists visit the famous Pontocho Alley on Sept. 7, 2015, in Kyoto, Japan. Kyoto is going through a massive tourism boom. It recently won the title of World’s Best City 2015, for the second consecutive year, in the consumer travel magazine Travel+Leisure. The total number of visitors to the city continues to climb year on year, and the city has set a goal of achieving 3 million foreign tourists, equating to a tourist spend of approximately $12 billion by the time the Olympics arrive in Tokyo in 2020.